With Easter just around the corner grocery stores in my neighborhood have transformed into miniature Willy Wonka chocolate (read candy) factories overnight. Temptation lurks around every corner of the candy aisle with strategically stacked myriad brands of candies vying for attention. I see children of varying sizes eyeing candies, working their minds to make the most important decision of their lives—which candy to take home? Then again there are those lucky ones who ride in the shopping carts while their parents load up their carts with candies. Oblivious of what’s happening they seem to enjoy their novel ride, a welcome change from their daily commute in a stroller. As I witness their excitement over candy I cannot help but write about the candies I enjoyed as a child. Mango Bite or Mango Mood comes first to mind. This ripe mango colored candy wrapped in a yellowish orange wrapper held together by a green knot and infused with mango flavor had a tantalizing effect on my palate. The lure of the pleasure of savoring a mango attracted me to it. The image of Coffy Bite pops up next. The USP of this dark brown strong coffee flavored candy was the dilemma your taste buds were left to battle against once you took a bite—coffee or toffee? Melody was another candy I enjoyed not because it was ‘choclatey’ but because it was voluminous compared to its peers. Tucked within the brown and golden wrapper it gave out the vibe of contentment. 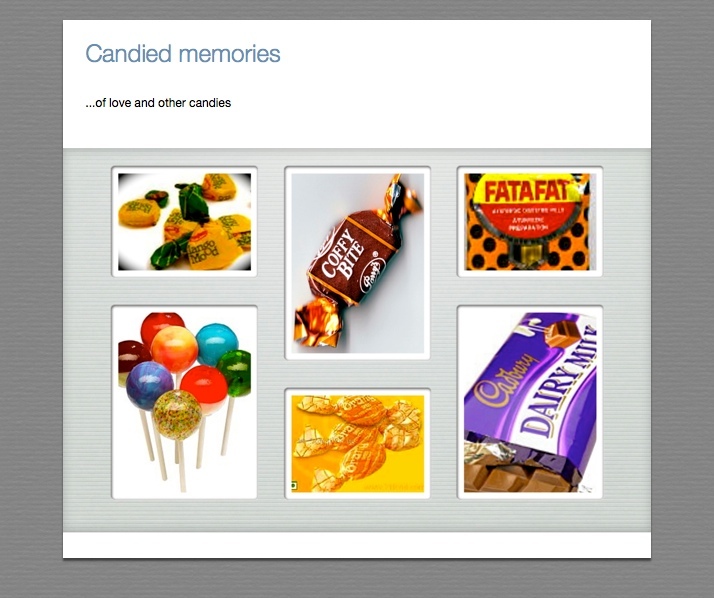 Swad, Chatarmatar, Fatafat and Hajmola formed the sweet and tangy genre of candy. While I could savour Swad and Hajmola on demand there was always a parental control on the other two. Chatarmatar (small red bead like ones) and Fatafat (black ones) came in sachets, each housing around ten to fifteen candies. They were notorious for staining your tongue and even your fingers, red or black depending on the one you devoured. My parents warned it was a sign that it was bad for the liver too. Remember Poppins, the variegated disc shaped candies, stacked together in a tube like wrapper? Each of the red, green, yellow and orange candies had a distinct flavor but conveyed the same element of fun. If you let your imagination run wild and wonder how a rainbow would taste like I would say like Poppins! Lollipops too belong to the genre of fun candies. Its myriad colors and flavors enticed me but the chocolate Cadbury lollipops with the gooey center had a special place in my heart. I always think of Lollipops as first cousins to ice creams on a stick. How can I ever forget those Parle Orange candies that my classmates got to sample each year on my birthday? Decked in a ‘colored dress’ and armed with candies I felt a strange superiority over my mates in school uniform. Those simple treats worked its magic drawing both attention and friends. Another memory associated with my school years are those cigarette shaped peppermint candies that some of my friends enjoyed on their bus rides back home from school. They were packed like cigarettes are and had a little red coloring at one end emulating a lighted cigarette. Eclairs was one of those lofty chocolate candies that I looked forward to enjoy more so because my sister had an aversion to it. She had a loose tooth once and she happened to pop in one of these super sticky candies in her mouth and voila! Eclairs acted as a surrogate dentist pulling her tooth out! This article would remain incomplete without the mention of Five Star, Dairy Milk and Fruit n Nuts. They were awe inspiring not only because of their regal taste but also because I could treat myself to these delicacies only once in a while, as the price tags that came along were regal too. Time has taken its toll on some of the candies I wrote about while the rest, the invincible ones, continue to pleasure. As I look back I can’t help but envy those times when a minuscule candy had the power to strike a gigantic smile on my face. Categories: Something Sweet | Tags: Candy, Chatarmatar, Chocolates, Dairy Milk, Easter, Eclairs, Fatafat, Hajmola, Lollipop, Mango Bite, Melody, Memories, Poppins, Swad | Permalink.